Sent by one of several compromised accounts, the emails use a display name of 'Invoice2go'. The email advises the recipient that their ‘invoice has not been opened yet' and includes a link to view the invoice. The link currently leads to a blank page. However, MailGuard has discovered that in some cases, the link triggers the download of a malicious file. 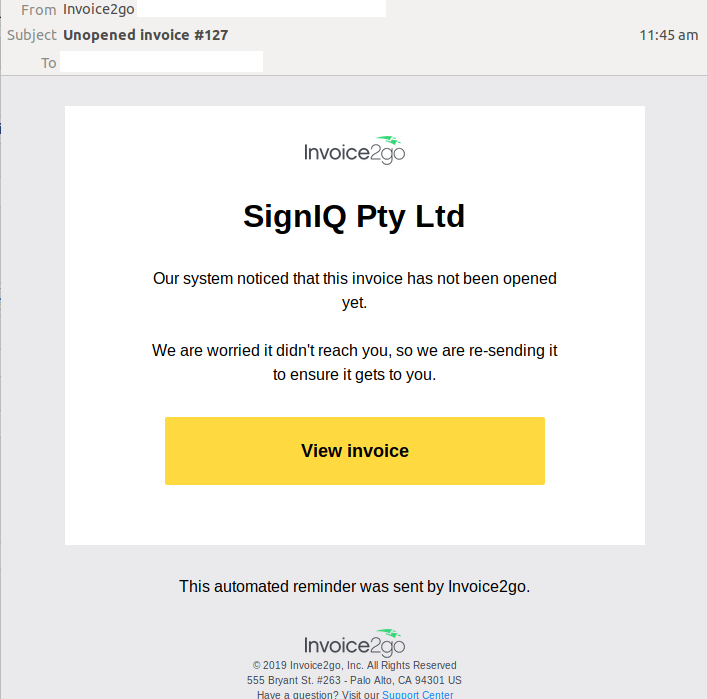 Some effort has gone into making this malicious email convincing enough to deceive victims; the design is decently executed as you can see in the screenshot above, with the inclusions of Invoice2Go’s branding and logo, that makes it look a lot like a genuine communication from the company. The usage of the subject ‘unopened invoice’ also creates a sense of mystery and urgency, motivating the recipient to view the invoice to see what it contains. MailGuard urges all cyber users to be vigilant when accessing their emails and look out for tell-tale signs of malicious emails. • Seem suspicious and ask you to download files or click any links within an email to access your account or other information. • Ask you to click on a link within the email body in order to access their website. If unsure call the company/person directly and ask whether the email is legitimate.